Forget about shopping for one, cooking for one, and eating leftovers for days and start enjoying the combined benefits of restaurant-grade food and home dining with the best meal delivery services for singles. Flexible, reliable, and 100% single-friendly, the services on this list deliver 1-portion meals fit for a king at more than reasonable prices. Freshly is a healthy meal delivery for one person that offers fresh, gluten-free breakfasts, lunches, and dinners that are high in protein, low in carbs, and as tasty as they are good for you. Get 30% Off Your First Week! BistroMD is a weight loss meal delivery that offers a range of meal programs designed for 1 person. Choose between plans for men, women, vegetarians, diabetics, and people on gluten-free diets. The Good Kitchen is an organic meal delivery that offers delicious, individually portioned, ready-to-heat meals that are 100% clean and free from GMOs, antibiotics, hormones, and gluten. Home Bistro is a veritable meal marketplace chock-full of exciting single-serving meals crafted by one of the best chefs in America. Order as often as you wish, no subscription required. Veestro is a vegan meal delivery for singles that offers healthy, plant-based breakfasts, entrées, soups, desserts, and juices. Order a la carte or opt for a handy meal pack or meal plan. 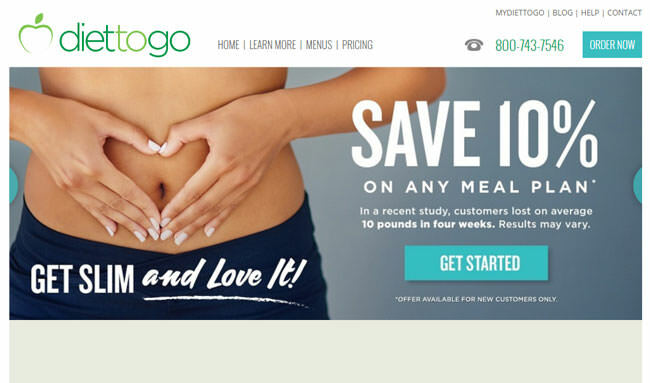 Diet-To-Go is a weight loss meal delivery for singles that offers 4 excellent weight loss plans for omnivores, vegetarians, people who suffer from diabetes, and fans of Atkins-style diets. Trifecta Nutrition is an organic meal delivery that offers omnivore, vegetarian, vegan, Paleo, and clean meals, all designed for 1 person. Opt for a meal plan or handpick meals from the a la carte menu. Healthy Chef Creations is another organic meal delivery that offers single-friendly meal plans for healthy eating and weight loss. Pick a pre-defined plan or create a custom plan of your own. Vegin’ Out is a vegan meal delivery service that offers individually portioned, plant-based meals made from fresh, natural, and organic ingredients, free from cholesterol and trans-fats. Magic Kitchen is a single-friendly meal delivery that offers ready-made meals for a variety of diets, including diabetic-friendly, vegetarian, low-carb, low-sodium, and gluten-free. The scarcity of one-person meal delivery services is as strange as it is infuriating. Most meal delivery services nowadays still primarily cater to couples and families, which is why many people who live alone either opt for takeout and frozen dinners or cook for themselves, often having to deal with more leftovers than they need. However, even though the situation is not as good as we would like it to be, we have managed to find several excellent single-friendly options that can make your dreams of eating healthy and gourmet food while investing zero effort into meal prep a reality. With meal delivery services for singles, you do not have to make any compromises. You can always have plenty of single-serving options at your disposal, so you do not have to order more food than you need. You can pick the meals you like and enjoy food that perfectly suits your dietary needs and preferences. You can schedule recurring deliveries or order as often and as many meals as you wish. These services are tailored to your needs and provide the ultimate home dining experience for singles. No longer do you have to order 2-serving meals and eat the same dish two days in a row. All your meals can be individually portioned and packaged, so you can just heat them or eat them straight from the box, with no clean-up or time wasted in the kitchen. Plus, with our top picks, you get to enjoy healthy food designed with various diets in mind, so your meals are not only good for you, they are also free from all the ingredients you dislike or need to eliminate from your diet. The best meal delivery services for singles are unique because they create their meals with singles in mind, unlike most meal delivery services currently available on the market. However, this is not the only feature that sets them apart from the rest. Their meals are single-friendly and designed to accommodate their patrons’ different personal preferences and lifestyles. Therefore, they do not only suit your needs portion-wise but aim to provide a completely personalized experience. They understand that single people cannot all fit into one homogenous category, providing a variety of options for special diets and leaving plenty of room for customization, both in terms of meal variety and ordering options. These services are as flexible as they get. Even if they offer pre-defined meal plans, they let you choose the number of meals you want to enjoy per day and during the week, allow you to skip deliveries, and enable you to create custom meal plans of your own, so you do not have to settle for anything that does not perfectly suit your expectations. With these services, you are the boss and have full control over what you receive in your deliveries. On top of that, they are usually much more affordable than takeout, so you can order completely carefree. With high-quality, single-portion meals designed to meet your dietary requirements, flexible ordering, and reasonable prices, all the meal delivery services for singles featured on our list constitute one of the best – if not the best option for single people seeking an easy and healthy eating solution that suits their lifestyle. Our search for the best meal delivery services for singles begins with a simple question: what do singles expect from a meal delivery service? Of course, the first requirement that comes to mind is the availability of single-serving options. Although this is one of the primary criteria, it is still only one of the many requirements that services need to satisfy in order to get a spot on our list. Our top picks always offer menus characterized by great variety. They know that all of their patrons have different tastes, which is why they offer everything from light, low-calorie meals to gourmet sensations that can impress virtually any foodie. Furthermore, they offer a range of meal options for patrons with special dietary needs, including gluten-free, vegetarian, vegan, diabetic-friendly, and many other delicious and healthy options. Along with the number of portions per meal, we also analyze portion size. We choose companies that offer perfectly portioned meals, with no leftovers – unless you want them. However, our top choices do not only strive to satisfy your appetite, they also offer meals with optimal nutritional values, providing your body with all the valuable nutrients it needs. In the final step of our selection process, we focus on subscription flexibility and affordability. We make sure that the companies on our list allow you to modify both your orders and your subscription any way you wish and that they offer meals that fit the average consumer’s budget. By applying all of these rigorous criteria, we can guarantee that all of the companies featured here can meet the expectations of their single patrons, regardless of their budget, preferences, and eating habits. The following price comparison is designed to help you easily figure out which of our top-ranked meal delivery services for singles best fits your budget. We have brought all the pricing information to one place, including the shipping costs and details about the companies’ delivery areas, so you can identify the perfect fit in a single glance. What all of our top picks have in common is that they are currently the best single-friendly options on the market. Now it is time to discover what makes each of these meal delivery companies unique. Explore their distinctive features in the mini-reviews below and choose the one that best satisfies your personal needs. Freshly is a gluten-free meal delivery that offers healthy meals designed for one person. Its rich menu features around 30 delicious entrées and breakfasts, including vegetarian, Paleo, low-calorie, low-carb, soy-free, and high-protein dishes. All the items on the menu are single-serving, made of all-natural, wholesome ingredients, and free from gluten, peanuts, artificial ingredients, preservatives, refined sugars, and hydrogenated oils. Order between 4 and 12 meals per week. Shipping is free on all orders. 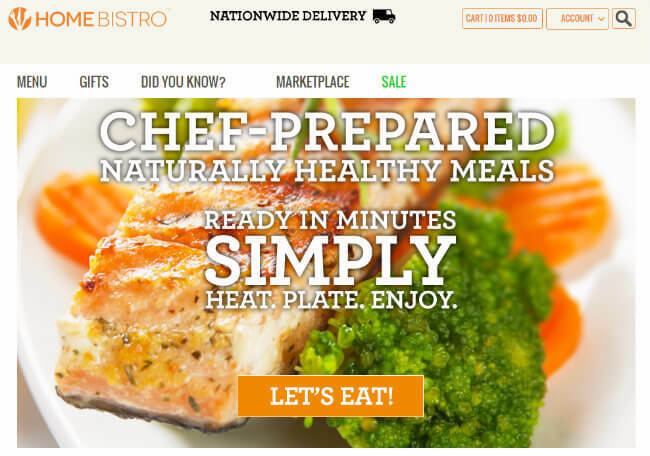 BistroMD is a meal delivery for one person that offers tasty meals designed to promote healthy weight loss. Its meals are calorie-controlled with an average daily intake of 1,100 to 1,400 calories. They rely on lean protein, complex carbs, and healthy fats and allow you to improve your diet and health while shedding pounds. Paying special attention to its customers’ varying dietary needs, BistroMD offers gluten-free, diabetic, senior, and menopause meal programs. The Good Kitchen is an organic meal delivery for singles that offers 3 excellent pre-defined meal plans and one custom meal plan that you can tailor to your needs. You can order anywhere between 5 and 35 single-serving meals per week and enjoy clean and tasty meals made of sustainably sourced and organic ingredients of the highest quality. The Good Kitchen meals are suitable for Paleo fans, keto and Whole30 dieters, and people on the gluten-free diet. Home Bistro is a healthy meal delivery for one person that allows you to enjoy some of the finest meals available on the market in the comfort of your own home. All the meals are freshly made by a top chef, using nothing but the freshest, natural ingredients, and delivered frozen for easier storage. The meals are calorie-controlled, low in sodium, and rich in superfoods. You can freely choose from dozens of individual meals and meal combos. Veestro is a single-friendly vegan meal delivery that allows you to shop any way you wish. You can order a la carte and choose from all kinds of plant-based breakfasts, entrées, soups, desserts, and juices. You can opt for one of the 8 meal packs for special diets and occasions. You can shed pounds with its weight loss meal plans or wash away toxins with its juice cleanses. Just choose your preferred ordering method and wait for healthy deliciousness to arrive. Diet-To-Go is a one-person weight loss meal delivery service with a decades-long tradition. Its weight loss programs are designed to help you both improve your health and reach your goal weight more easily, without starving and giving up on delicious food. Its famous heart-healthy, low-calorie Balance menu is available in 3 versions, created with omnivores, vegetarians, and diabetics in mind. If you need to chuck out carbs, you can opt for the excellent Carb30 menu. Trifecta Nutrition is an organic meal delivery for singles known for its dedication to quality. It uses only the highest-quality, all-natural, organic ingredients and crafts meals suitable for vegans, vegetarians, Paleo lovers, fans of classic, well-balanced dishes, and people who want to eat clean. Opt for one of the 5 customizable meal plans or order pre-cooked proteins, carbohydrates, and vegetables in bulk and create innovative meals that perfectly suit your taste. 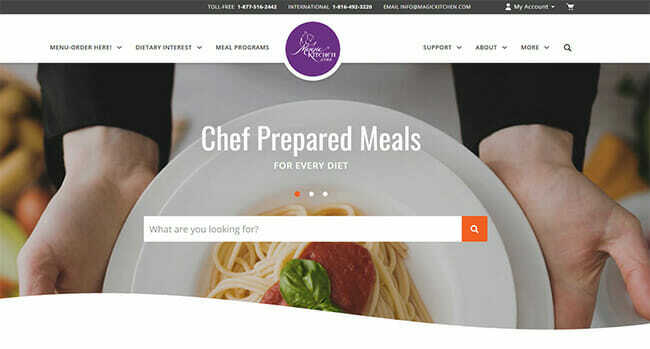 Healthy Chef Creations is a healthy meal delivery that offers meal plans for all kinds of healthy lifestyles. Whether you want to lose weight or just eat healthily, you can choose from a variety of pre-defined meal plans, request a custom meal plan or create a completely personalized plan by ordering from the a la carte menu. All meals are individually portioned and packaged and made from fresh, wholesome ingredients. Vegin’ Out is a vegan meal delivery for one person that offers gorgeous plant-based meals for individuals who prefer cruelty-free cuisine and want to eat healthily. Its menu changes every week and includes 8-9 delicious items. You get to enjoy professionally cooked vegetarian-vegan entrées, soups, side dishes, and the famous Vegin’ Out vegan cookies. If you need more food for the week, you can order additional entrées, sides, cookies, and salad dressings. With Magic Kitchen healthy meal delivery, you can easily plan your meals for the week and enjoy delicious dishes that perfectly suit your needs. You can order main courses, side dishes, soups, and desserts a la carte and opt for convenient one-person meal bundles. Alternatively, you can get complete meals including an entrée and 1-2 sides. You can receive 1, 2 or 3 meals per day, with plenty of special diet options at your disposal, including gluten-free, diabetic-friendly, renal-friendly, low-sodium, and more.